Munich - FC Schalke 04 and VfB Stuttgart were the big winners on Saturday afternoon as both picked up three pivotal points in their respective battles at the top and bottom of the table, while the spoils were shared between European qualification hopefuls VfL Wolfsburg and FC Augsburg. 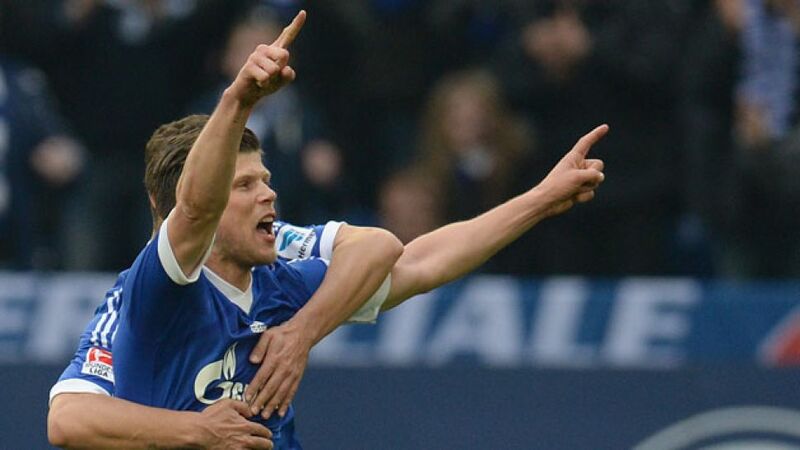 FC Schalke 04 warmed up for Tuesday’s derby against Borussia Dortmund with a 3-1 win over basement dwellers Eintracht Braunschweig at the Veltins-Arena. The hosts dominated from the outset and took a deserved lead on 17 minutes. Leon Goretzka picked up Max Meyer’s pass thirty yards out, before firing a dipping shot towards goal that whistled past Daniel Davari and into the net. The Braunschweig keeper then had to be on his toes to keep out Kaan Ayhan’s free-kick, and Meyer could have doubled the Royal Blues advantage before half-time, only for his effort from the edge of the box to fly straight at Davari. Schalke picked up in the second half where they left off in the first and Klaas-Jan Huntelaar spurned a gilt-edged opportunity to double their lead when he failed to make proper contact with Kevin-Prince Boateng’s cut-back, allowing the visiting defence to recover and clear the ball to safety. Huntelaar atoned for his miss 20 minutes into the second half when his long-range free-kick took a wicked deflection of Mirko Boland to wrong-foot Davari, giving the Royal Blues a 2-0 lead they richly deserved on the balance of play. Benjamin Kessel pulled a goal back for the visitors late on, but Adam Szalai sealed the points in stoppage time to clinch a third straight league win for Jens Keller’s team ahead of this week’s meeting with their local rivals. VfB Stuttgart put an end to a run of ten games without a win, picking up three pivotal points in the relegation battle by beating ten-men Hamburger SV 1-0 to move themselves out of the bottom two. As expected, nerves were prevalent in the early stages of an intense, fast-paced encounter that boasted everything but the all-important final ball. Vedad Ibisevic, back from a five-game ban and keen to make up for lost time, had an early effort blocked before heading just wide of the upright from a Ibrahima Traore free-kick. Hamburg were enjoying a greater share of possession and almost rewarded themselves when Milan Badelj unleashed a fierce drive just wide of the target. However, with both sides bereft of creativity in the final third, neither were able to establish a control on proceedings as they went in at the break with the deadlock still intact. Hamburg were making life difficult for their struggling hosts, but had the stuffing knocked out of them when Hakan Calhanoglu saw red for a second bookable offence eight minutes after the restart. The sending off sparked Stuttgart into life, yet despite forcing the Red Shorts onto the back foot, they were perhaps fortunate to take the lead as Traore pounced on Heiko Westermann’s poor clearance to find substitute Alexandru Maxim unmarked at the back post for the simplest of finishes. With HSV limited to creating chances from set-pieces, the hosts continued to press their advantage and would have doubled their lead were it not for Rene Adler's late heroics, but it remained enough for them to maintain their unbeaten record under Huub Stevens. Ten-men VfL Wolfsburg maintained their grip on a spot in the top six after overturning a one-goal half-time deficit to clinch a hard-fought 1-1 draw with FC Augsburg. Both sides kept things tight early with the midfield battle dominating proceedings during the opening exchanges. Despite being wary of their visitors’ prowess on the counter, the Wolves sought to turn the screw as Maximilian Arnold and Ivica Olic both went close inside the opening 20 minutes. Kevin De Bruyne was at the heart of the Wolves’ most promising moments and almost produced an opener as Ivan Perisic headed wide from his pin-point cross - a wasted chance that came back to haunt them. Having offered very little going forward, the visitors struck against the run of play on the stroke of half-time when Tobias Werner cut in from the left before curling an effort into the far corner. Though their shell-shocked hosts proved relatively tame after the restart, Augsburg seemed intent on patiently waiting for the Wolves to make a mistake before bursting forward at pace as they sought to press their advantage. Olic almost made them pay as a result, but could only guide his header over the bar as the visitors’ backline continued to stand firm despite being put under increasing pressure. However, sitting in the precarious position of boasting a slender lead, Augsburg’s lack of killer instinct cost them dearly when Olic produced a well-timed header to convert the Wolves’ first shot on target, restoring parity with ten minutes left and ensuring that both sides took home a share of the spoils in spite of De Bruyne’s late sending off.